It’s quite obvious that we’re going to see the LG G5 later this month at the Mobile World Congress 2016. The company has sent out invites for the event, and it seems the Korean manufacturer plans to offer teasers of what the handset will come with. 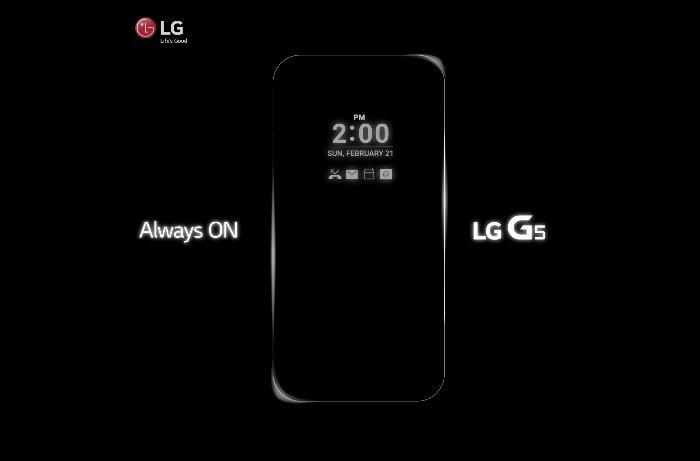 Recently, LG posted a teaser on their Facebook page which hints that LG G5 will come with always on display when it launches. The teaser is posted in a form of a GIF image showing multiple smartphone screens fading, ending up with the LG G5 with time and notifications on the screen — a similar form of display we’ve seen on handsets from other manufacturers such as Motorola. Rumors suggest that LG G5 will come with a 5.6-inch display sporting a resolution of 2560 by 1440 pixels resolution, a Qualcomm Snapdragon 820 processor paired with 4GB of RAM and 64GB of expandable storage. There’s a 20MP camera for photos and videos. Leaks hint at a dual-camera setup on the back and dual LED flash as well as a fingerprint sensor just below the camera button. There’s no confirmation about the specifications, so we’d advise users to take it with a pinch of salt. We’ll update you as soon as its officially announced.